That looks like it's definitely on the way now Matt! I'll be following this thread so I can refer to Mike's suggestions again, as well as seeing how this tree develops. Brilliant thread! Bloody good advice from Mike that we can all heed. And those Japanese trees for inspiration. Wow! My favourite being the one without the central leader. Thanks for posting MattS - you're well on the way with this tree! I'm green with envy. 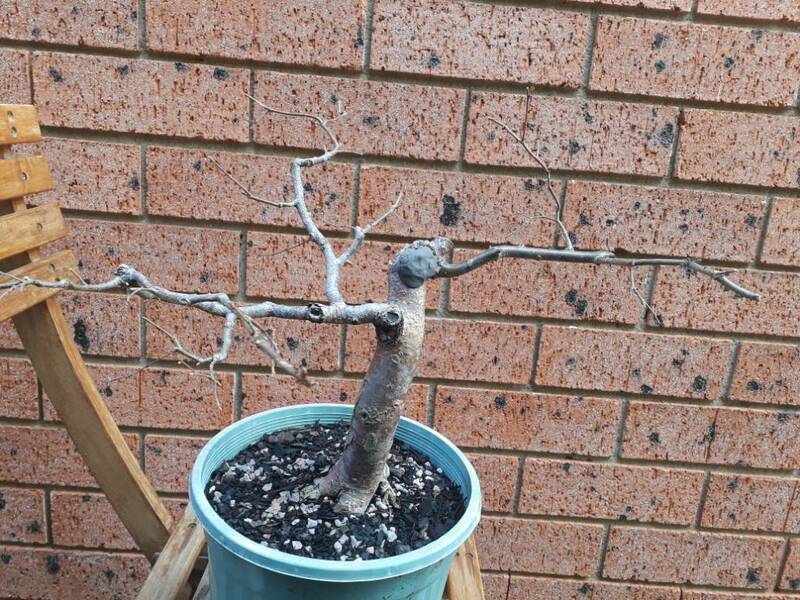 Matt S wrote: I've followed Treeman's advice and been defoliating this Zelkova hard to force the ramification. Last year I cut back two thirds of the growth and of course the tree responded in spring with shoots all over, although most of them were in bunches of three or more and not always where I wanted. I defoliated twice over the summer and cut everything back to 2 buds and although the growth was really uneven I ended up last winter with fine shoots where I wanted them. This year I followed the same routine and today I defoliated and trimmed for the second time, so I'm hoping to get a third round in before summer is over. It took hours to do this today and I didn't get time to tweak it with wire but you can see the difference with the original picture. Thanks again to Mike, this is a good methodical approach that is really forcing the tree to ramify. The growth is starting to even out too, and even though I'm many years away from getting the fine ramification I want the tree is well on it's way. Matt that’s a beautiful tree where did you get that fantastic pot? Great information treeman, i have a zelokva that just runs and runs. I've been cutting back to two pairs of leaves but just can't get it to ramify particularly well so i'll try defoliation as well! Ive been having a lot of lightbulb moments over the past few months, thanks partly to this site. Thanks to all contributing members. 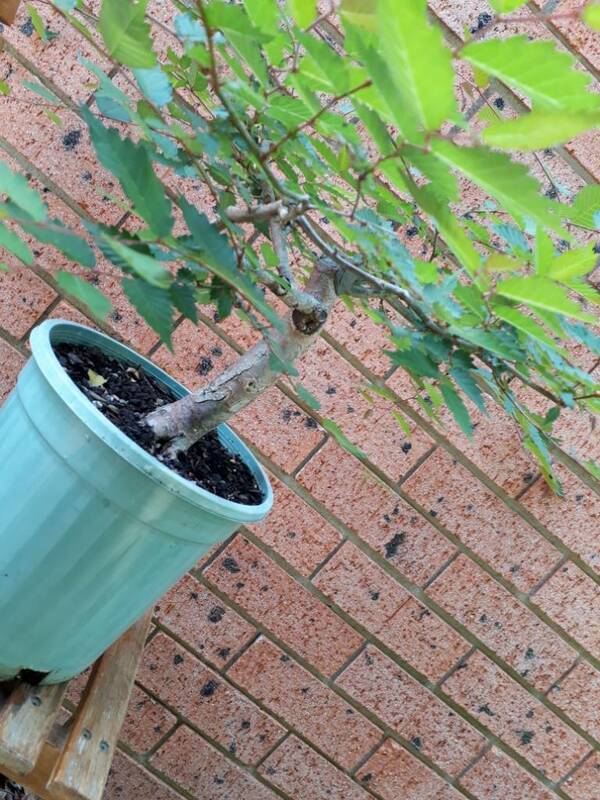 So I have had a semi mature japanese grey bark elm for a few years now and I've been trying to train it to an informal upright style since the beginning when all along it's probably been telling me it's a broom style, and I've ignored it. It's threads like this that gives me the 'aha' moment. Amongst this navel gazing I have a question about the broom style. Is it better stylistically to have the main leader and all the broom aspects coming from that leader; or to have a point on the main trunk where the broom branch structure originates from? If you have that 'one point' won't that create a large bulge in the trunk at that point? Including some pics of the elm in question, including a late winter pic. Has a lot of work but I think a broom might work? Yours looks surprisingly similar to mine; yours in thicker though my trunk extends a little higher. I'm getting mad growth outwards,but upward growth is very difficult to encourage. I've tried wiring up a new leader, as well as pruning back the laterals and leaving the leader untouched, but it just wants to put on the width but not the height. Like most styles there are variants in broom style. 1. Classic broom: Trunk rises vertically then splits into several (2-5?) main rising branches that continue to divide further to the canopy outline. Having several branches coming from one point can thicken the trunk at that point. I know that when developing broom trees some growers drill out the centre of the trunk at the point the branches grow then constrict the outside so that any thickening is directed into the hollow trunk rather than swelling outwards. I've seen others make v cuts between the branches to disguise any flat cut on the top of the trunk which should also minimise swelling. Some classic broom bonsai have the branches slightly staggered so they are close together but not all from the same place. It is probably expected that there will be some enlarging of the trunk in broom style. With a good nebari, which will also swell the base, it probably looks quite natural. 2. Intact leader: where the main trunk continues right through the tree and rising branches come off all along. Trunk should be vertical and straight. Broom is, in fact, the deciduous version of formal upright. Nebari is important. Best to be evenly spread and strong. Without these key aspects the tree won't really be broom style. Doesn't mean it is no good or not bonsai, just not really broom. Okay I'm listening. A tilt of the trunk too? So the 'current' side branch doesn't run parallel to the ground? Sorry I should have asked better questions in my previous post rather than asking for snippets. Why do you think your particular design would work better than a broom? Is the current (side branch) structure not compatible for broom? What do you see longer term design wise? Take me on your journey, as unconventional as it could be. I'm not trying to put you on the spot I'm genuinely interested in learning the why of it. Hi Pureheart. The pot is a fairly basic glazed pot I picked up at a local bonsai nursery. It's not a high quality pot but the colour and dimensions match the tree nicely. Is it better stylistically to have the main leader and all the broom aspects coming from that leader; or to have a point on the main trunk where the broom branch structure originates from? Hi gnichols - shibui has answered this question nicely and if you look at the great examples of broom style zelkova's on this thread you'll see examples of both. It's really just a matter of preference. As for why a broom wouldn't suit your current tree, I have a few thoughts. A broom's trunk should be straight with symmetrical roots and the primary branches should leave the trunk at an upward, shallow angle. Check out the examples again (rather than mine). A broom is meant to convey a younger tree full of vitality rather than the usual old tree full of character. For your tree to do this you'd need to chop the trunk from below the branches and start from scratch. Nothing wrong with that but as treeman pointed out you have an interesting trunkline with nice taper that you could use now. 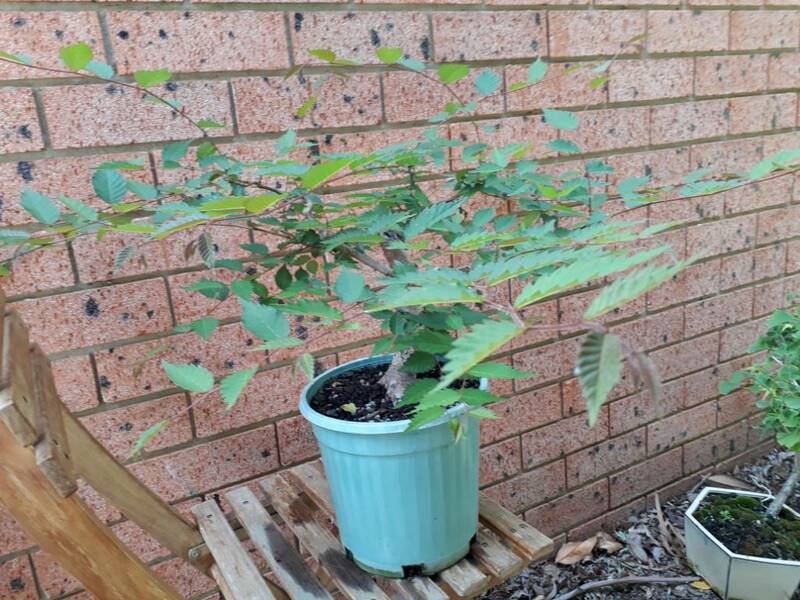 As an update to the tree in this thread, a few weeks ago I did a third defoliation and I noticed that although the resulting new shoots sprang out as before there wasn't as much backbudding and in a lot of cases the branch that I cut back to two leaves has only produced one replacement shoot, whereas in previous defoliations I would have had two shoots. (does that make sense?). I'm assuming that the tree is less vigorous than it was earlier in the season but I'm still impressed it handled three defoliations.